Flint is the local name for the erratic boulders from the Ice Ages. You will come across many these glacial rocks of all sizes along this route. Within a distance of just one kilometer from this route, you will find at least 18 hunebeds, constructed from very large glacial boulders. The smaller flints were used for laying paths and roads. The Flint Route will take you past many different kinds of ‘boulder art’ in the area around the Hunebed capital city of Borger. See also the Flintenroute (link) for the detailed route map and description. Borger has been called the capital of the ‘Hunebeds’ of the Netherlands. In the Hunebed Center you will find information about the hunebeds and about the Funnel Beaker Culture. You will gain an idea of how and why the hunebeds were built and learn about the daily life and work of the people who built them. The center also provides an overview of other archaeological monuments, such as burial mounds, urn fields, Celtic Fields (field complexes) and old cart tracks. Next to the Hunebed Center stands the largest hunebed in the Netherlands. In the rolling landscape of the forestry area of Exloo you can see many traces of the distant past. There is a hunebed in the middle of the woods and burial mounds are present all around. At one particular junction stands a large stone next to a very large oak tree. This is a so-called ‘markensteen’, a stone which formerly marked the boundary between the villages of Odoorn, Exloo and Buinen. Deeper in the woods there are many deep round ponds; these are known as ‘collapsed pingos’ and date from the Weichsel Ice Age. In the forestry area of Odoorn an extensive part of the woodland was blown down during the great storm of 1972. One half has been replanted and the other half has been left as an open space where sheep graze. In this area is a 15 meter high hill with a look-out tower and tea house. The hill is called Poolshoogte and was originally built with shovels and wheelbarrows as part of an unemployment relief programme in 1934. Because of all the blisters people got on their hands, the hill has the nickname of ‘Blood Hill’. For the youngest children the hill at Poolshoogte does indeed look as if it might be bewitched, and there is a walking route for children from the tea house in search of the witch called Ipsewips. Odoorn is first mentioned in 1327 and originated along one of the old routes linking the stronghold of Coevorden to the city of Groningen. The 12th century nave of the reformed church is built with erratic boulders up to a height of about 3 meters and the wall is about 1 meter thick. The rest of the church dates from 1856. Today Odoorn is famous for the ‘Drentse Wandel4Daagse’, an annual 4-day walking festival around Ascension Day and for the largest International Folklore Spectacle in the Netherlands with dancing, singing, music and traditional dress. 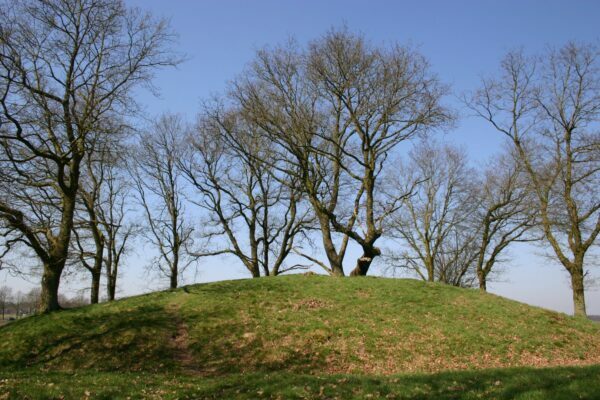 On the left along the road from Odoorn to Valthe stands a remarkable burial mound named after a certain Egbert. He supposedly to have met his end by hanging himself on this mound. His nickname of `Eppie’ is now coupled with the burial mound. Valthe is first mentioned in 1217, but in fact, this area was already inhabited in ancient times. A number of hunebeds and burial mounds can be found near Valthe. In the center and at the edge of the village to the east there are still several ancient farmhouses. In 1621 the Valterschans was laid out in order to defend the Valtherdijk (the road to the monastery at Ter Apel), but it has now disappeared. In 1660 – according to the parson, doctor and historian J. Picardt from Coevorden (1600-1670) – the streets of Coevorden were paved with stones brought from the ruins of the wealthy and civilised city of Hunsow. He investigated the area and allegedly found a street pattern made of stones. This legendary city situated between Borger and Valthe was supposedly sacked by the Normans in the year 808. Exloo is first mentioned in 1376. Exloo is a typical Drenthe farming village. Apart from a small area of new buildings this is a collection of old farm houses loosely spread out along the streets. Only a church is missing; the people of Exloo went to church in Odoorn. The monumental Bebingehoes from 1722 burnt down in 2017. Opposite it stands the sheepfold with an information center. Every day a herd of sheep leaves this sheepfold, with their shepherd, towards the nearby Molenveld – an open heath land with juniper bushes. Exloo is also well-known for the International Festival of Old Crafts..